This Site provides information about the work of glass sculptor Henner Schroder. To learn about unique glass sculptures click on the studio shot below. To collaborate with the artist in the creation of architectural glass tile panels click on the tile window. Glass sculptor Henner Schroder creates unique pieces of art utilizing novel glass working techniques. 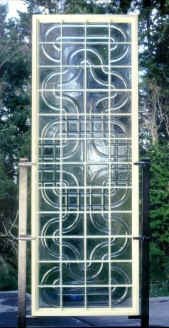 In addition to large scale sandcast glass and steel sculptures he has developed the technique of rolling cast glass slabs into cylinders, some as heavy as 100 lbs. By moldblowing, shaping, bending and twisting large pieces of cast glass, Schroder adds three-dimensionality to the pieces. Many of the sculptures contain pictograph and petroglyph images floating inside the pieces of cast glass, which are inspired by sites from around the globe. Vitroglyph Tiles © represent a unique concept in contemporary building enhancement. The architectural tiles, designed by Schröder, can be arranged into millions of different patterns in collaboration with the client. With the aid of a free and down-loadable computer program, clients can design their own compositions of glass block. These designs are then executed at the studio and the finished panel is shipped ready for installation. Henner Schröder was born in Germany in 1955, and raised in West Berlin. In 1977 he moved to the US to pursue art studies. After studying at Massachusetts College of Art and receiving a fellowship at the Creative Glass Center of America he has taught at the Pilchuck Glass School as well as Pratt Fine Art Center, Seattle. In the early 90’s he spent 5 years designing and building the Chimacum Glass Studio of which he is co-owner/operator. 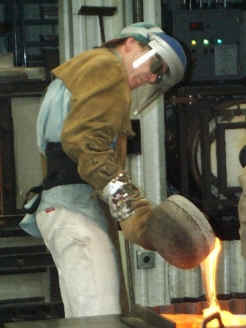 This state of the art glass casting studio, is the largest facility of its kind in the Pacific North West.